Carp Fishing & Bird Watching on Lake Shkodra, Albania - Lake Shkodra Resort, Shkoder, Albania. Camping, Glamping Hotel, Lodge, Holiday Accommodation. Restaurant & Bar. Excursions to Lake Koman, Shkoder, Thethi & Kruja. Thethi Guesthouse Hotel Booking. Lake Shkodra Resort is situated directly on Lake Shkodra, only 7km from the city centre of Shkoder/Shkodra and a 1 hour and 30 minute drive from the capital Tirana. The lake is the largest lake in the Balkans, stretching 41km between Montenegro and Albania. Lake Shkodra ultimately runs through the Buna River into the Adriatic. The lake's calm fresh warm water makes it perfect for swimming, water sports, fishing (see below), bird and butterfly watching (see below). Leisure activities such as kayaking, canoeing, rowing and windsurfing all take place on the lake. Canoes, stand up paddle boards (SUP) and pedalos can be hired from the reception area. Small motorised boats are allowed on the lake, free of charge. Some of the last Pelicans in Europe have been seen on the lake and it's home to over 200 bird species, making it one of the largest bird reserves in Europe and popular with bird watchers. The lake is on one of the most important migration routes in Europe, and is a critical site for migratory birds, some of which are globally threatened. In the summer Lake Shkodra is a sanctuary for 1.5 to 2.5 million birds. Small cormorants nest in the marshy north of the lake and represent one of the three most important colonies in the world. The rare and endangered curly pelican, nests on floating peat islands at the north end of the lake. Below are some of the birds that can be spotted on or around the lake. 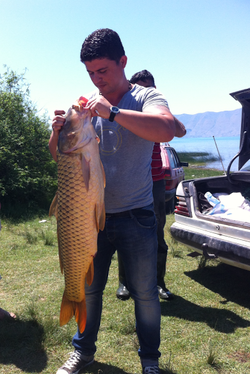 Photo (left) of Alban our Waiter at Lake Shkodra Resort Restaurant, with a 14kg Carp. Our restaurant serves freshly caught Carp from Lake Shkodra. There are plenty of things to do at Lake Shkodra Resort – you certainly won’t find yourself bored while visiting. While here, you’ll have the chance to do a little swimming or sightseeing, play watersports or photograph wildlife, or you can even just sit back and relax. But we’d like to recommend another fun activity to try during your visit: Introducing your children to the sport of fishing. Fishing is a great activity for visitors of all ages, including young children, and your Lake Shkodra Resort visit offers the perfect opportunity to break out the rods and reels and see what’s biting. We not only permit our guests to fish while visiting the resort – we encourage it! But to make sure that you and your kids have a great time, you’ll want to follow the tips below. This will give you the best chance to see smiles on your kids’ faces and give them the best chance of catching plenty of fish. 1. Outfit your children with the proper equipment. It’s no fun for anyone to fish with equipment that doesn’t suit them, and this is especially true for children who are just learning the sport. Accordingly, you’ll want to avoid providing them with complicated fishing reels (such as bait-casting reels) or rods that are too long for them to wield comfortably. Instead, set them up with a 5- to 6-foot-long spinning or spincasting combo, which will be easy for them to learn to use and short enough to cast and control. Note that nets are not permitted in Lake Shkodra. 2. Pick a good location. It’s always important to fish in a good location, but when fishing with young children, it is important to pick a place that is easy to access. Fortunately for our guests, we have a large fishing pier that juts right out into Lake Shkodra and allows you to reach 5- to 7-foot-deep water by foot. Alternatively, you can hire one of the local guides to take you even farther from shore. Additionally, the guides will be able to offer valuable advice and help improve your chances greatly. 3. Match your bait to your target species. There are a number of fish species in Lake Shkodra, including bleak, eel, sturgeon, lamprey, mullet, guppy and flounder. However, you’ll probably want to target carp or the introduced rainbow trout when fishing with your kids. But it’s generally best to pick one of the species and plan accordingly, as they’re best caught with different baits and presentations. Carp are primarily bottom-feeding fish, who are usually caught with things like corn kernels, tomatoes or commercially produced baits. Most anglers use these baits on medium-sized treble hooks and add a sinker to the line to keep it near the bottom. You’ll generally need the carp to find your bait, so this type of fishing requires some patience and is a better choice for older kids. Rainbow trout, on the other hand, are probably the better choice for younger anglers, although older kids (and plenty of adults!) still find them fantastic quarry. Many anglers love to use fly fishing gear to catch rainbow trout but spinning gear will work too. Small spoons, spinner baits and other artificial lures can be used to catch them, or you can add a bit of split shot to the line for weight and use hooked worms or leaches. 4. Fish alongside your kids. You’ll have to spend a lot of time helping your kids when they first start learning. You’ll have to bait hooks, untangle lines and recommend good places to cast. But try to get your own line in the water while doing so and fish between parental tasks. Thanks to your experience, you’re more likely to get bites and hook fish than they are, and this gives you the chance to pass the rod to your youngster, so he or she can reel in the fish and enjoy all of the glory! Fishing certainly isn’t the only fun way to spend time with your children while visiting Lake Shkodra Resort, but it is easily one of the most rewarding. Just be sure that you follow the suggestions above to help ensure everyone has a good time and that your youngsters have the best chance to catch a few fish. But before you visit, be sure to check out the complete guide to introducing your children to the sport of fishing at Outdoor Empire. There, you’ll learn more about the tips provided above, as well as a few more ways to help ensure your child’s first fishing trip is a good one.